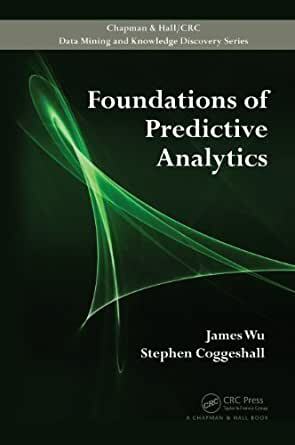 Drawing on the authors’ two decades of experience in applied modeling and data mining, Foundations of Predictive Analytics presents the fundamental background required for analyzing data and building models for many practical applications, such as consumer behavior modeling, risk and marketing analytics, and other areas. It also discusses a variety of practical topics that are frequently missing from similar texts. The book begins with the statistical and linear algebra/matrix foundation of modeling methods, from distributions to cumulant and copula functions to Cornish–Fisher expansion and other useful but hard-to-find statistical techniques. It then describes common and unusual linear methods as well as popular nonlinear modeling approaches, including additive models, trees, support vector machine, fuzzy systems, clustering, naïve Bayes, and neural nets. The authors go on to cover methodologies used in time series and forecasting, such as ARIMA, GARCH, and survival analysis. They also present a range of optimization techniques and explore several special topics, such as Dempster–Shafer theory. An in-depth collection of the most important fundamental material on predictive analytics, this self-contained book provides the necessary information for understanding various techniques for exploratory data analysis and modeling. It explains the algorithmic details behind each technique (including underlying assumptions and mathematical formulations) and shows how to prepare and encode data, select variables, use model goodness measures, normalize odds, and perform reject inference. The book’s website at www.DataMinerXL.com offers the DataMinerXL software for building predictive models. The site also includes more examples and information on modeling. "The book deals with the necessary knowledge for understanding the theoretical and practical aspects regarding the common techniques of exploratory data analysis and modeling. For a better understanding, the underlying assumptions, mathematical formulations, and the algorithms involved by these techniques are presented. The authors made the text self-contained, the book being designed as a supplemental and referential resource for the practitioners dealing with this domain. The book also discusses a variety of practical topics more or less present in the literature."